Have you ever wanted to start a grill in the morning? Do you ever think or say "Yeah, I find the idea of devoting most of a day to tending to hickory logs and smelling like smoke appealing"? Smoking your own beef brisket is not a choice. It is a lifestyle, at least for a day. Oh, but is it ever rewarding. Having a man in your life who likes to tend fire and have a few beers in the sun helps, too☺. The resulting meat is why God created fire, meat, and our taste buds. Seriously, look at that smoke ring! If you are still reading, chances are that you might want to attempt this sort of undertaking. Even if you are not sure that you are ready or willing to take on the task, you can read on for the rub and/or sauce recipes. The sauce is great on a burger or chicken, so get on with your bad self and make your own sauce. I'm telling you-- making your own sauce has its own magic. In a large saucepan over medium-high heat, melt the butter. Add the onions and saute until soft and translucent, about 5-7 minutes. Add the remaining ingredients and stir to combine. Bring the mixture to a boil. Reduce the heat to low and simmer for 30 minutes. Sauce will reduce and thicken. Allow the sauce to cool to room temperature. Using a hand-held immersion blender or standard blender, puree the sauce until smooth. Sauce can be made one day in advance. 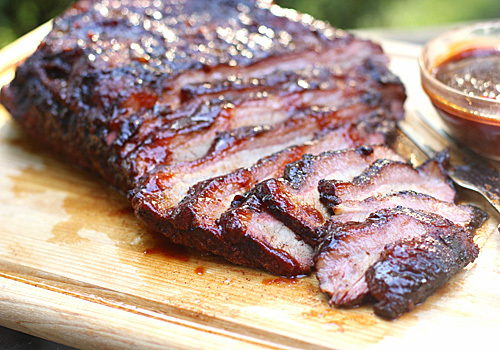 Allow the brisket to sit at room temperature for 1 hour. Meanwhile prepare a charcoal grill for indirect heat using lump hardwood charcoal to 225-250ºF. Place a drip pan under the grate where the beef will be. Add a hickory log and make sure you have a good smoke before adding the beef. To prepare the rub, combine the brown sugar, granulated sugar, onion powder, garlic powder, paprika, chili powder, salt, and pepper in a medium bowl. Pat the brisket dry with paper towels. Cover the entire brisket with the mustard. Rub the rub mixture all over, massaging into the skin. Oil the cooking grates and place the brisket (fat side up!) on the grill and cook until the internal temperature reaches 160-165º F (this should take about 3 to 3 1/2 hours), rotating (not flipping) the brisket half way through cooking, adding hickory logs as needed and maintaining the temperature of the coals. Tear off two pieces of heavy-duty aluminum foil that will be large enough to completely wrap the brisket and place over a baking sheet. Remove the brisket from the grill and place, fat side up, on the foil. One sheet at a time, wrap the brisket tightly. Return the wrapped brisket to the grill and cook until the internal temperature reaches 180º F, about 2 1/2 to 3 hours, adding hickory logs as needed and maintaining the temperature of the coals. Meanwhile, line a small cooler with thick bath towels to insulate the inside of the cooler. Remove the brisket from the grill. Keep the aluminum foil wrap in place and wrap again in plastic wrap. Place the brisket in a baking dish or disposable pan and place it in the cooler. Cover the top of the brisket with another towel, close the lid and allow the meat to rest for 1 hour. Prepare the grill with a medium fire. Carefully unwrap the brisket, reserving meat juices. Baste the brisket with the sauce and grill on both sides until sauce has caramelized and set, about 5 to 10 minutes per side. Transfer the brisket to a cutting board, lightly tent with aluminum foil, and allow to rest for 20 minutes before slicing. Meanwhile, de-fat the reserved meat juices. Add 1/2 cup of the meat juices to the barbecue sauce. Serve the sauce warm or at room temperature. Slice the beef against the grain and transfer to a serving platter and serve with the juices and the sauce. Enjoy! That brisket is so good I don't think I would want to share it with 10-12 other people! :) Fantastic!!! You could use your gas grill. Soak some hickory chips in water and place them in an aluminum pan over the flame. Keep the brisket on the opposite side of the grill away from the flame. Keep an eye on the hickory chips and replenish them with new ones when they looked dried an exhausted. You will have to do this several times. You will loose some of that charcoal flavor, but the smoke and sauce goodness will be present. That looks so heavenly. I have always wanted to make brisket. This picture and your recipe have convinced me to give it a try! This looks so amazing I want to lick the screen LOL. Awesome looking brisket. One of my favorites to smoke. It is well worth time it takes and the sandwiches the day after...so good.